Well, first of all, Boxing Day has nothing to do with the boxing sport! 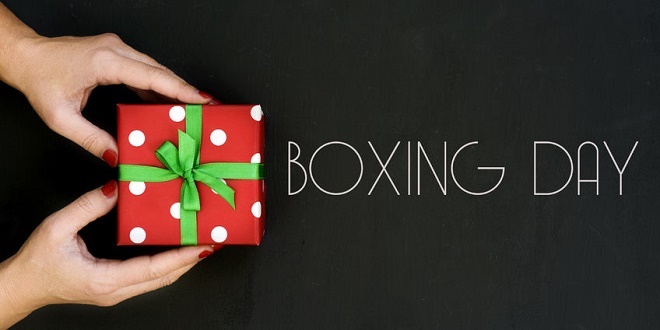 Boxing Day is a national holiday in the United Kingdom celebrated on December 26 each year. But, why is this day known as the Boxing Day? There are a number of stories that tell the origin of its name, but none of them are definitive enough! In one version of the story, it is said that Boxing Day is when servants of the wealthy were given a day off to visit their families. The servants used to work on Christmas and they were only given a holiday on the first day after Christmas. Another story says that in the Victorian Era, churches displayed a box of parishioners to donate money. The box is opened on the next day, and the collected money is distributed to the poor. In an another story, it was a tradition for tradesmen to collect “Christmas boxes” on the first weekday as a thank you present for good service over the year. Besides that, it was also said that the servants would go home on Boxing Day to give the boxes to their families. So, with that many different version of the origin story, how is this day actually celebrated? In modern times, Boxing Day is a day to eat leftover turkey and spend time with family or friends. It is also the time when British people can be witnessed participating in bizarre traditions including fun runs, charity events, and swimming in the icy cold water. Until 2004, fox hunting was also a tradition for this day. However, hunters still get dressed to the sound of a hunting horn to this day even when the fox hunting is banned. Besides that, the day is also synonymous with sport matches and horse racing events organized all over the country especially in the UK. In Ireland, this day is celebrated as St. Stephen’s Day. Saint Stephen was a saint that was stoned to death for believing in Jesus Christ. And yes, shopping is also a Boxing Day sport! December 26 is a big day for sales as well! It was known as a shopping holiday (akin to Black Friday sale) in Canada, New Zealand, Australia and the UK. There are exceptional price reductions in stores to lure out many shopaholics across the country. Retailers will offer special deals to attract customers since the day can bring them a very big profit! ­One day and so many ways to celebrate! Isn’t it fun? Boxing Day is surely a special day for many of us. From shopping to participating in charity runs, you will surely not run out of fun things to do. There is no better way to spend the remaining days of the year! Is Boxing Day celebrated in your region? How are you planning to celebrate it? Share with us in the comments section below. Do you know that Japan celebrate Christmas by having a KFC feast? Check out other Asia’s quirky holiday celebrations here! World Vegan Day: Check Out What The Carrybeanies Did!